Hello! My name is Jonathan Sotelo, and I have been a member of the Music and Arts team since July 2017. My main instrument is percussion, specifically mallet instruments. My favorite by far is the marimba! Other instruments that I dabble in are classical guitar, tenor sax, and steel pan! At UMBC, I perform with the Symphony Orchestra. the Percussion Ensemble, and I direct the UMBC Pandemic Steel Band! Outside of UMBC, I also perform with Meade Steel, an adult steel drum ensemble! 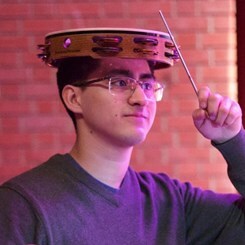 If you have any questions on percussion, or any other instruments, I am always happy to help!